A while back, we reviewed some of the general best practices if you’re going to run Facebook ads. 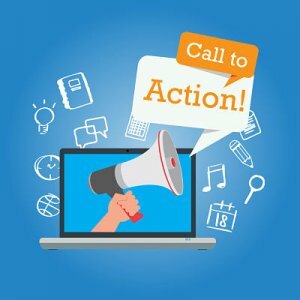 I want to drill down a little deeper into one of the most critical tools you have to increase conversions – the call to action (CTA) trigger. Bottom line – if your audience does not interact with your ad, you can’t convert them. You absolutely can and should use call to action buttons if that makes sense with your message. As you’re building your Facebook ad, the ad manager will give you pre-set buttons with a variety of options from contact us to download, learn more, sign up or request time. I know it seems obvious but choose your CTA carefully. Match the offer with the button label, so people know exactly what’s at the other end of the click. Don’t forget about calls to action that don’t require an actual call to action button. Your ad copy might invite the audience to click on the ad itself to take an action (give us your feedback, sign up for free product, vote for a favorite, etc.) or to answer a question that you pose either in your graphic or text. Another element of a successful Facebook ad campaign is social proof. Social proof is public social engagement that other users can see. This includes likes or other reactions, comments, and shares of your ad. When someone sees your ad, they’ll also see who among their Facebook connections already interacted with the ad. These small interactions can matter just as much, if not more, than the ad copy when it comes to gaining more conversions. For most of us, if we see a Facebook ad with ten positive comments and a couple dozen likes, we’re much more likely to pay attention to the ad than if it had no reactions showing at all. The power of consumer-generated reviews and reactions carry over to this channel as well. That’s why, according to a study by KISSmetrics, Facebook ads with some sort of social proof had 300% more conversions, and 50% lower clicks per actions and cost per clicks. In addition, social proof has an additional, less obvious, benefit. Social engagement boosts your relevance score, which gives you a higher priority in the ad bidding system. It’s a great way to lower your ad costs. Once the campaign is launched, the best way you can improve the performance of the campaign is to keep an eye on the metrics. One of the most under-utilized is the relevance score. The Relevance Score is a calculated metric that monitors how your audience is reacting to a particular ad. The scores can go from 1 to 10, depending on the positive and negative feedback your ads receive. If your score is below a 5, you should do some testing to see if it’s your audience, the message or the visual that is causing the disconnect. Choosing when your ads appear (based on your audience’s time zone) is another way to increase success. By watching which times of day perform the best, you can adjust your campaign to increase conversions and reduce your cost per lead. If you’re running ads to build brand awareness or some other top of the funnel activity, then you aren’t measuring success by conversions, and this may be less important to your campaign. But in most cases, you’re running Facebook ads because you’re trying to drive an action of some kind. You want to give yourself every advantage you can and how you entice the audience to click on your ad is the most important step.